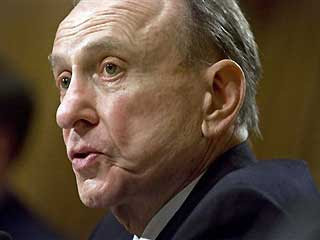 It came as no shock to me today to hear that veteran GOP Senator Arlen Specter switched parties from Republican to Democrat. The Senator's actions merely solidified what I, and many other Conservatives already suspected, or knew: Sen. Specter is a Liberal. 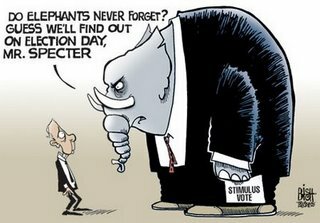 Previously a Republican in name only (RINO), Sen. Specter took intense heat for breaking with the Republican Caucus in voting for President Obama's economic stimulus bill. Sen. Specter faced a challenging re-election bid in 2010 and faced Republican opposition in the primary. The move to the Democratic Party has ensured Sen. Specter the support of President Obama and potentially the advantage of having no opponent in the primary. This may seem like it was a clever move by the Senator, and maybe it was, but I think this was just the ticket to outrage Republicans enough to defeat Specter in 2010 and get a true Conservative elected to the Senate. Sen. Specter's move to caucus with the Democrats, puts the Democratic Party one seat closer to the magic number of 60 seats, which would essentially make the filibuster a worthless option for the Republicans. It's worth it! A strong GOP candidate should be able to beat Specter in 2010 and a real Republican will finally hold the seat. Sen. Specter's action is good for the GOP on one side of the spectrum, but disgraceful on the other side. The Senator was elected as a Republican, presumably by a Republican base of constituents, and the act of switching parties undermines the election process, and defies the will of the people who elected him. The act of switching parties because of a disagreement with the caucus is contrary to the belief that American voters have, that the official that they elect will reflect the views that they campaigned on, and the views of the party. Maybe this view of a representative elector is naive in this day and age, but it is, in my view, essential to the democratic function of electing our public officials. The fact that an elected official can so easily switch parties to try to save face does nothing to strengthen the faith and the trust that Americans have in the election process and it is little wonder why so few Americans actually go out to vote. Still, I think this is a positive step for the GOP, and time will tell if this was a smart move on Specter's part, 2010 is coming fast. Term limits are viewed favorable when the likes of Specter are considered. I'm sure other Congressmen and Congresswomen would be useful well beyond any term limit. For the majority, though, I think term limits might keep them focused on why they joined politics in the first place. At 79, I'm not sure Specter can realte to most of the people he represents. Sure he can, he represents the big money left, as for the people who voted for him and expected to be represented by him, it's the same old piss on you exhibited by all professional politicians. Human nature hasn't changed, there are very few who rise above the screw you, I got mine mentality. I wasn't surprised at all - especially after the Stimulus vote. We've known for a long time Specter was a RINO. Time to go, Arlen. BTW - I had to create a blog for a class, so I know what it's like to try to get comments. Good luck with your blog and your class. Well, the Democrats have had to deal with Lieberman's changes of heart. Switches happen. Specter says that the party has moved too far to the right and is no longer in synch with public needs and desires--in Pennsylvania. Because the Republicans are aiming to rebuild the party--it might be a good idea to listen closely to Specter's reasoning--to get beyond indignation. He's been around for some 29 years and is pretty savvy. So the question would be WHY are the Pennsylvanians upset with their party? Susan, Specter didn't move because we moved too far to the right. He moved because he was going to loose in the primary! The party does not need to get in line with needs and desires of anyone to grow. What it needs to do is stick to its guns on issues and spending. People will gravitate to the party that represents them, be it D R or Independant/Libertarian. Why would a party not respond to a nation's evolving sense of its priorities and needs? It seems to me that this is precisely the job of any people's representative and all parties. I take your point and share your cynicism about politicians seeking votes--very true. But isn't it possible that the public and its representatives are in dialogue and that the one learns from the other--the two creating new "policy"? If Specter's allegiance is to his consituency--his people-- and not to the party, isn't this a justifiable position for a politician to take? Whether you agree or not, still Republicans will benefit from looking at the Pennsylvanians' apparently new agenda. This is not pandering--it's honoring the people's will. The case of Specter - in combination with the fiasco going on in Minnesota - seem to me to be fairly convincing evidence supporting the need to REPEAL THE 17TH AMENDMENT. Senators were not intended by the Founding Fathers to be elected by the people - for good reason. Sure. If in fact it is. However, when you consider that Specter started out as a Democrat and changed parties in order to be elected, and that in all probability he's just changed parties again because polls showed that he'd lose a Republican primary, it sounds more like he just wants to stay in office - no matter who he represents. Because they don't represent the nation??? They represent the views of the people who make up the party. If those people "evolve" to a different set of priorities and needs, then indeed, the party will respond. If your position is that "the nation" has a sense of evolving priorities and needs, then who exactly is it that determines that? People are the nation and people spoke with their votes. Simple as that. wow-wee! what a great conversation going on here! i wanted to comment about Lieberman, though s.r. already mentioned him. he ran as a democratic vp for crying out loud and he campaigned for a republican president two elections later! who the heck knows what changes minds here... maybe a newfound integrity? look at mccain, that dude totally flipped on some key issues. was it politico or was it listening to others and considering the possibility that they had something there. i do think it's a gimmick to win the election in this case... the right says the nation is center-right. i think it's center-left. i guess it depends on what pundit you're listening to. True...people spoke with their votes. 53% were of one opinion, 47% were of a different opinion. That's pretty close to 50-50 ... so to assume that "the nation" is of one opinion...and that opinion is "evolving" sounds like wishful thinking to me. Just because the 53% side won, does not mean that the 47% are required to "evolve" to the same other side. Much as those who tout "bipartisanship" want it to be so. "Bipartisanship", by the way, also means "I won - so we'll do it my way". Did Senator Specter’s voting record show that he was to the left on some of the issues? If this is the case, then the people that voted for him should not be to upset, because his record would have shown that he was not a conservative. No politician switches sides without having a record on agreeing with the other side on some issues. My example would be former secretary of state Colin Powell. He is a progressive republican and has shown to agree with Liberals on the issue of more government. I would not be surprised if he switches sides on the political isle. This is why it is so important to look at a politician’s record over what they say. Someone tagged him as a "random" voter - in other words, unlike Lieberman who is consistently Liberal with the one exception of the war on Iraq, Specter has been all over the place. 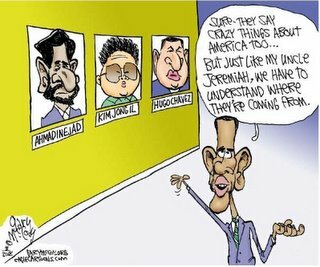 There are those who consider it no big loss - that he's the Dem's headache now. Guess we'll see.